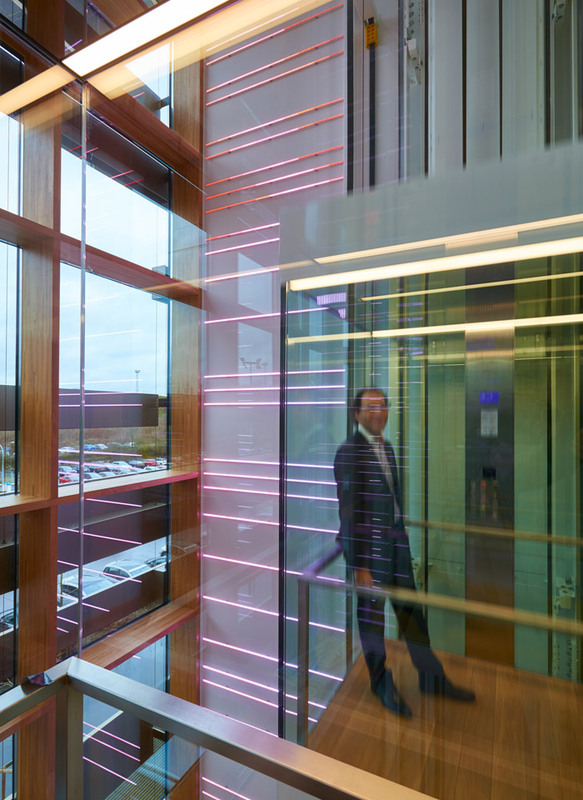 The key business divisions at Enovos – wind power, hydropower, biomethane, solar energy and fossil fuels – were to be communicated on the lift and visualised using light for the glass lift shaft at the energy company. 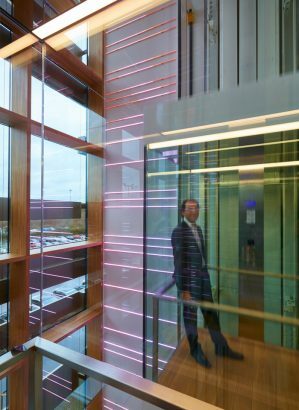 The five floors at Enovos’ main administrative offices in the Luxembourg town of Schlassgoard follow a defined colour scheme, which is reflected in the illumination of the lift in a dynamic and strongly symbolic manner. The ground floor refers to wind power, expressed in the colours of clouds – pale blue, white and grey. The first floor is characterised by water, represented in blue. 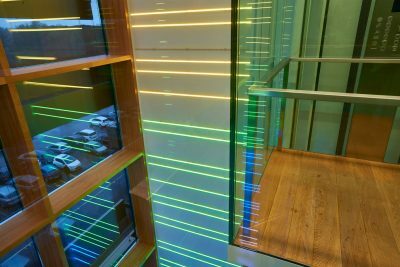 The second floor is dedicated to the world of plants and the topic of biomethane, represented in green. On the third floor, yellow stands for solar power. 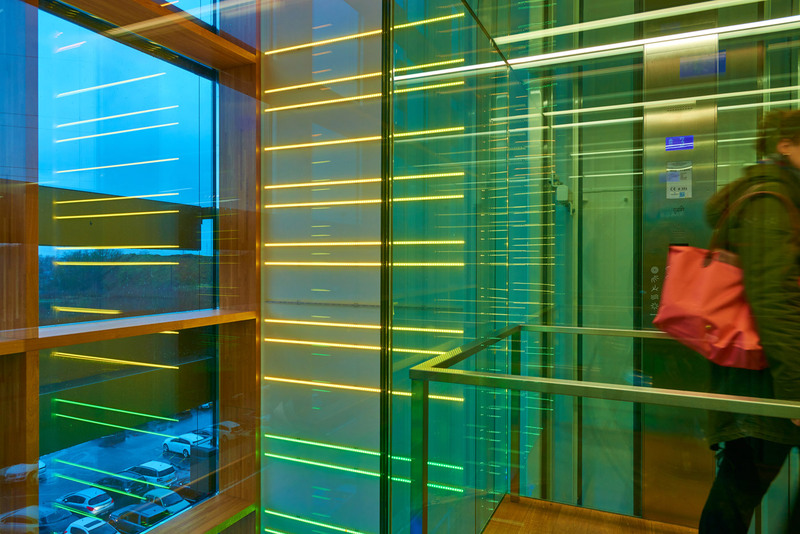 Orange, as the colour of fire, refers to fossil fuels on the fourth floor. 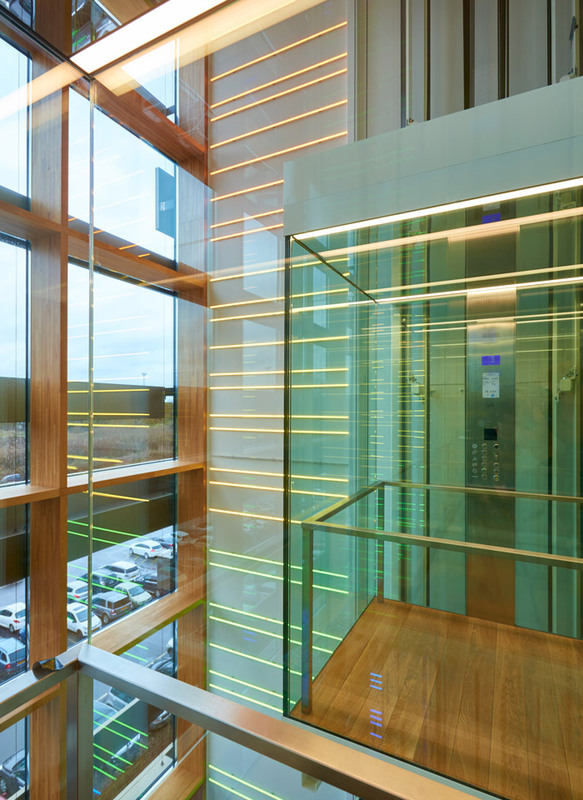 The lift contains two glass baskets, a band of windows throughout accentuates the open-looking structure. 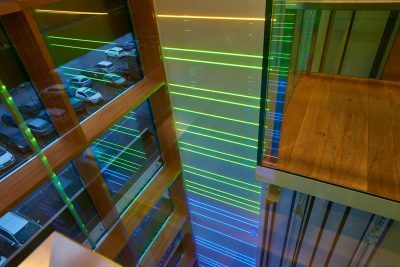 The light sculpture is composed of 56 transverse LED light strips over the entire height of the shaft. Each strip measures 165 cm and consists of ten separately regulated segments, each 16.5 cm in length. This resolution of 56 x 10 pixels in the overall image ensures that videos can be played. 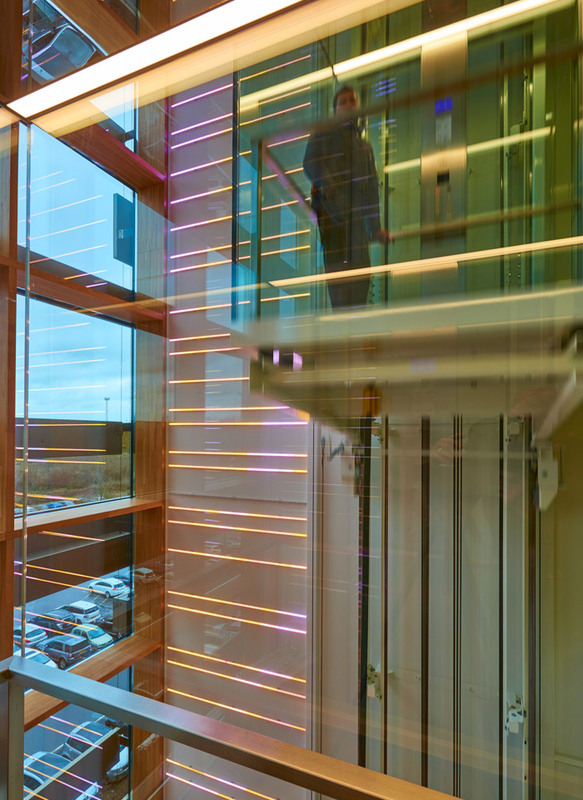 The dynamic nature of the lift is also illustrated by moving images: on the ground floor using films of windmills (wind power), waves appear on the first floor (hydropower), leaves sway on the second floor (biomethane), on the third floor the sun rises (solar power) and flames flicker on the fourth floor (fire, fossil fuel). When the lift is summoned, a soft colour image appears. As soon as the lift starts moving, it triggers the video sequence for the requested floor, the speed of the video is matched to the lift’s speed. If both cabins are summoned at the same time, the film is shown for the last floor requested. 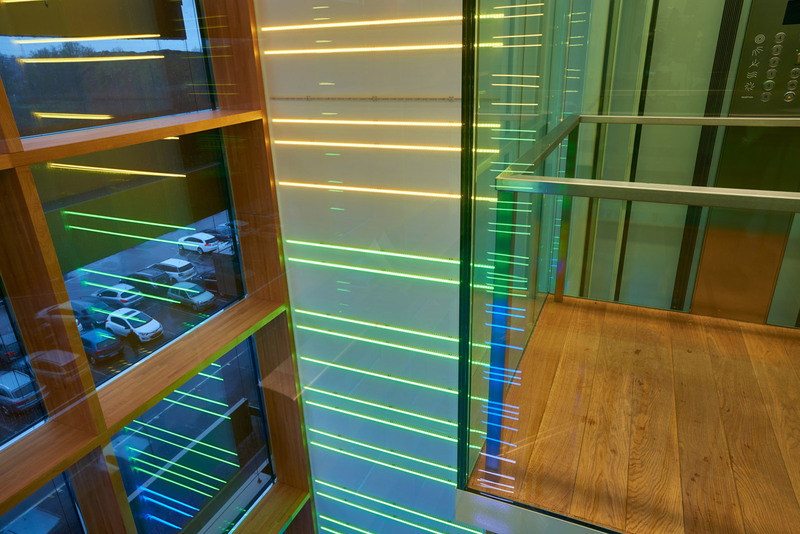 Controls are managed via DMX, chromaticity and configuration can be adjusted on the premises.